It's December, and once again, a rare harvest is celebrated in the small town of Sta. Rita. The cool December air signals the start of the annual Duman season. The rich rice fields of Pampanga normally yields a bountiful harvest of regular white rice at least three times a year. But the rare green rice often called "green gold", can only be harvested in December, and in such limited quantities. A farmer can usually harvest around 300 cavans or sacks of the regular white rice for every hectare, but only around 4 cavans of duman, an extremely low yield. This limited annual harvest adds to the mystique of Duman, driving up its price to as high as thirty to forty times the price per kilo of regular rice. The rarity of this unique green rice makes it a much sought after delicacy, and for those in the know, sourcing such a rare product is almost as tedious as producing duman. Pretty amazing. Nothing beats a good slice of Pizza....and here's to another year of pizza love. Visit http://www.onlinecollegecourses.com/pizza-obsession for more details on the cool infographic. Dude for Food is now on Facebook, check out the FB Page to receive regular updates on good eats. Better yet, click "Like" and enjoy the ride...just look for the FB "Like" widget on the right sidebar. An Italian native married to a Filipina, Chef Lombardi offers his own favorites from the old country, rustic and traditional Italian dishes at reasonable prices. And at Lombardi's, you'll find an extensive selection of dishes from cold and hot starters, pizza and pasta, main courses, wine and coffee and of course, desserts. After trying out Greeka Kouzina's Roast Lamb, I had to go back. And after singlehandedly wiping out the roast lamb, surprising both myself and the friendly staff at Greeka Kouzina, I decided to go for something lighter (check out my previous post on Greeka Kouzina's Roast Lamb here at http://dude4food.blogspot.com/2012/10/greeka-kouzina-taste-of-greece-in-san.html). Aside from their grilled lamb dishes, Greeka Kouzina also offers their own unique burger, one with a cool Greek twist. And I go for Greeka Kouzina's Lamb Burger. The holiday season is here, and there's no better way to celebrate than having a great meal with friends and family. And the family style meals at Italianni's are always a good choice. Now there's two more reasons to have a great meal with friends and family at Italianni's. The new Christmas Platters from Italianni's are perfect for get togethers, with The Country Classic and The Farmers Feast Christmas Platters. Cool. Each of Italianni's new Christmas Platters consist of a pasta, chicken and meat dish, a pretty cool mix of flavors with something for everyone. I recently got to sample both The Country Classic and The Farmers Feast at Italianni's along with other bloggers for lunch last weekend, and that was one cool lunch. It's been a while since I last visited Racks, and I remember the good old days when I used to frequent Racks for a slab of ribs and their awesome barbecue sauce, the extra hot sauce. I've always enjoyed the dry rub style of ribs at Racks, the way a proper slab of ribs should be. But over time, Racks seemed to have slowed down in an increasingly competitive market. But Racks is back, and under its new management, poised to reclaim its former market position. Maintaining its core of premium "flame grilled, falls off the bone" ribs Racks has always been known for, it recently expanded its offerings to include a new line of Breakfast Meals, which includes their trademark meat products. And having ribs for breakfast is definitely all the motivation I need to check out the new Breakfast meals. A culinary term for mixture, Mesclun Restaurant and Cafe presents a refreshing and diverse mix of both local and international flavors created by young Chef Katrina Kuhn Alcantara and her staff. In one amazing lunch, I got to experience the full range of flavors at Mesclun, including familiar and comforting flavors with some refreshing twists. My previous posts highlighted classic dishes reinvented, and that culinary trend continues with Mesclun Restaurant and Cafe featuring Chef Katrina's personal culinary take on classic dishes. Drawing from her own favorite dishes enriched by her numerous travels abroad, Chef Katrina presents a wide range of flavors at Mesclun, an inspired mix of classic old world cuisine updated with new world notes and Mesclun's personal touch. And yes, I got to sample Mesclun's much talked about sourdough pizzas. For some odd reason, this December month feels like summer, the glare and heat clearly not helping the shopping rush. Some fresh fruit juices should cool things down a bit, and we start with Flapjacks' Cucumber Breeze (P 125) and Apple Juice (P 75). It was the usual busy Friday evening, but this was going to be no ordinary evening. And after going through the mad rush hour traffic, I was looking forward to a cool evening with some premium wines, excellent food, and great company. It was my first real wine tasting, and as part of my personal continuous learning program, this was one event I wouldn't miss. And since the wine tasting was held at Cova Tapas y Sangria, my new favorite place, it was a no brainer. Good food, great wine, I'm there. And what an amazing evening. Sampling a new line of unique, artisanal premium wines from Stonehedge paired with Cova's exquisite tapas, now that sounds like a seriously good pairing. Napa Valley's Stonehedge Winery is recognized for its elegantly handcrafted wines with its meticulous and gentle care of the grapes from vine to bottle, allowing each bottle to "let the fruit show the way." And Cova Tapas y Sangria prepared new dishes specially for this wine tasting. Italianni's Seafood Cioppino. T.G.I. Fridays' Jack Daniel's Burger and Ball Park Nachos. Village Tavern's Maryland Style Crab Cakes. Flapjacks' Cajun Spiced Pork Chops. Watami's Beef Short Ribs. Bulgogi Brothers' Kkotdeungsim Gui. All personal favorites, and with six other restaurant concepts under The Bistro Group, there are still many other dishes to try and add to your list favorites. And with The Bistro Group's Premiere Card, you can get exclusive privileges while enjoying your favorite dishes. Pretty cool. And with the coming holiday season, it's the perfect gift for your foodie friend. Or you can reward yourself with a full year of good eats...now that's cool. 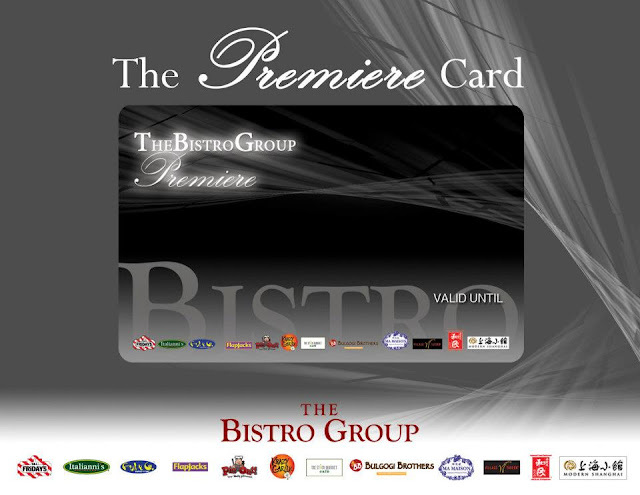 Get your exclusive Premiere Card now, and enjoy all your favorite dishes from The Bistro Group, definitely a cool deal. You may contact The Bistro Group at 836-7141 for inquiries or visit any of your favorite Bistro Group restaurants near you. A watermelon steak for dinner...seriously? Yup, I never thought I'd enjoy a vegetarian dinner, but I did. And for one night, I was one happy vegetarian dude. Pipino specializes in vegetarian food, made with the same distinct culinary flair by Chef Ed Buguia's Pino Resto Bar. All the dishes are 100% plant-based and vegan, and has since received numerous culinary awards for its creative vegan menu. I have to admit, being a steak and burger guy, I had some doubts about going vegan even for just one evening. But then again, Chef Ed Buguia never fails to surprise diners with his inventive and playful culinary style. Traditional Filipino favorites reinvented with a twist. That's Pino in a nutshell. And in one amazing dinner, I got to sample the full range of Pino's fun, playful and creative culinary style with flavors that are comfortingly familiar yet different, new and refreshing. Pino has been transforming traditional Filipino dishes since 2008, updating old favorites with new flavors, textures and ingredients. And with a new branch in Makati, more diners can experience Pino Resto Bar's distinct and refreshing take on classic Filipino dishes. Meet the new BBQnator from Wendy's...two juicy quarter pound imported beef patties. Six strips of tasty smoked bacon. Two slices of American Cheese. Topped with a crunchy onion ring. And an amazing smoked hickory barbecue sauce. Awesome. Three amazing lechons. Five hours of pure pork bliss. Dinner with an amazing family. And an international chef and Food Network TV host. Awesome. And that's exactly how dinner went last Tuesday. I've heard stories about Dedet de la Fuente Santos' Pepita's Kitchen, and her famous, near legendary Lechon Degustacion dinners held in their family home. And when I received a text about dinner at Pepita's Kitchen, I immediately confirmed. Definitely a no-brainer, not this one. Finally, I get to try Pepita's Kitchen's signature feast, all fourteen courses. And meet an international chef and Food Network TV host. All in one amazing evening. Perfect. Sometimes you find great food in the most unexpected places. Tucked away in Quezon City is a culinary gem specializing in classic Italian American comfort food, a cool find that's worth the drive. Formerly Bistro Napa located at Il Terrazo also in Quezon City, the owners decided to move to a new location, converting a residential space to house the new Napa Restaurant and Bar. The fun and eclectic mix of wooden and wicker chairs with wrought iron chairs and plush sofas add to the overall charm of the place. The overall look emphasizes relaxed dining, an appropriate backdrop to Napa Restaurant and Bar's cuisine. A piece of the wine country in the middle of Quezon City. And with the new location comes an updated menu, with a focus on comfort food like pizza, pasta and other popular favorites. I've had Village Tavern's crab cakes on my mind for the past few days, and after trying out some signature dishes previously, I had to come back. This time, a light lunch with Village Tavern's other signature dishes. The Freshly Squeezed Apple Carrot Juice (P 180+), always a good start. Naturally sweet, though it comes with syrup if you want it sweeter. But it's really good as is. Doritos and Pizza Hut concludes another cross promotion offering a free Pizza Hut meal with the redemption of specially marked bags of Doritos. The redemption period ran from September 1 and ended on November 30, giving me only a few more days to "grab a pizza meal."